Sony sees the critical and box office success of Warner Brother'sThe Lego Movie (2014) and decides to attempt to pull a oneup. This could be one of the worst movies of all time and/or the downfall of Sony Pictures Animation. What did you think of The Lego Movie? Did it live up the hype in your eyes? Plus, pitch us a movie by using Emoticons then a brief summary to help decipher the plot. Despite, 6% Score on Rottentomatoes, this cinematic turd earned $24.6 million. How could you think anything else? There's posters, moving and static, for the thing everywhere. At least that's the case in Southampton. I saw a trailer for it when I went to see Cars 3, (not my choice of film btw,) and it doesn't look anywhere near as good as Cars 3 which wasn't really that good. when your kids get over a certain age, you will be free of having to with such glop. I wanna see "An Inconvenient Sequel"
Not even when it's free on TV. Reasonable position you have there. » Wait! What?! 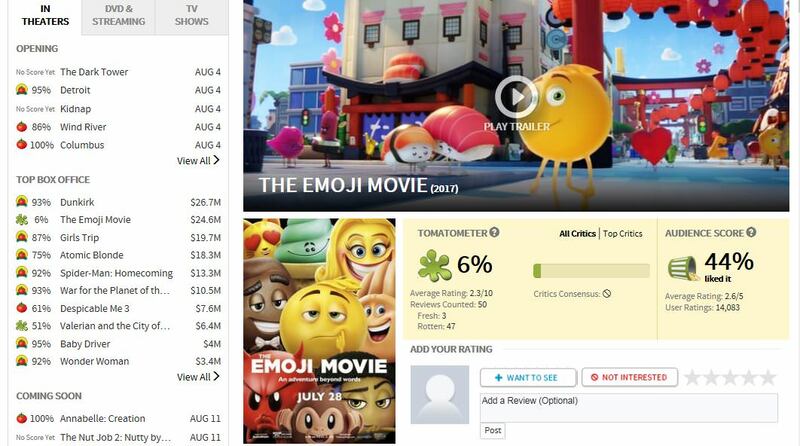 The Emoji Movie is a Real Thing?